Los Angeles (Dec. 20, 2017) – Wrestling Hall of Fame broadcaster Jim Ross and champion fighter Josh Barnett will return as AXS TV’s New Japan Pro Wrestling (NJPW) broadcast team in 2018, announced AXS TV FIGHTS CEO Andrew Simon. The acclaimed commentary duo kick off the New Year with AXS TV’s Wrestle Kingdom 12 special on Saturday, Jan. 6 at 8pE/5pP. AXS TV’s award-winning weekly NJPW series returns to Friday nights on Jan. 12 at 8pE/5pP, with additional coverage from Wrestle Kingdom 12. Rounding out the network’s first quarter schedule will be matches from New Beginning Sapporo, New Beginning Osaka and more. 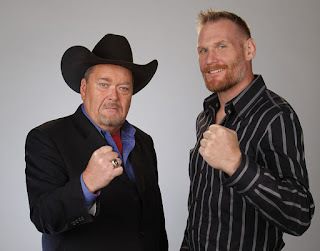 A former UFC Heavyweight Champion and veteran wrestler, Barnett has provided expert analysis for NJPW on AXS TV since the series debuted in 2015. Barnett’s storied combat sports career is highlighted by multiple headlining and title fights in the UFC, Strikeforce, PRIDE and Pancrase. His wrestling background includes competing for heavyweight belts in NJPW, Inoki Genome Federation (IGF) and TNA. He has also trained extensively with some of NJPW’s biggest stars and currently coaches his own team of pro wrestlers and MMA fighters in Los Angeles. "I'm excited to be returning to AXS TV,” said Ross, ”and with my partner Josh Barnett we look forward to another exciting year with AXS TV and their NJPW programming. NJPW has some of the finest athletes in the world performing for them and it's an honor to be able to add a narrative to their bouts." "I love being a part of the growing New Japan Pro Wrestling expansion into the U.S.,” said Barnett,” and with more shows to come, I am ready to roll up my sleeves, bust out a few hundred squats, and get to calling the best wrestling action in the world." AXS TV produces the English language version of "New Japan Pro Wrestling" in association with TV ASAHI CORPORATION, the distributor of NJPW.